The Extract Storyboard Dialog Box lets you divide a storyboard into several parts. Each export portion of the storyboard will be saved as a different file. You can choose to save an intact copy of the entire storyboard or divide the project into separate files. Select File > Project Management > Extract. The Extract Storyboard window opens. Lets you select scenes to include in the extraction. Opens the New Storyboard Project dialog box in which you can specify the name of the new storyboard project. The selected scenes will be placed in this project. Displays the projects that contain extracted scenes. 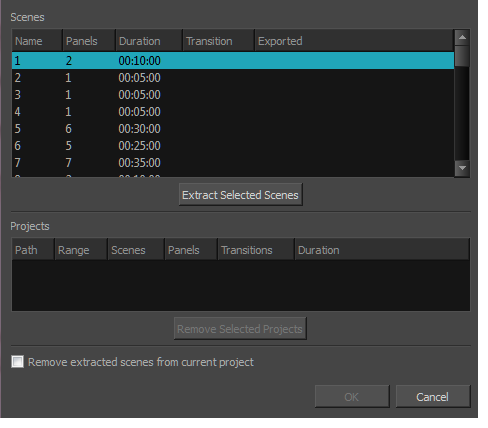 Removes the extracted scenes from the project. If you want to keep the entire storyboard project intact, deselect this option.